Pop-up alerts, system tray balloons, animated banners, and blinking taskbar icons all conspire to steal our focus. As you sit in front of your screen trying to thread words together into something that makes sense, the distractions of a modern operating system can be maddening. Ommwriter Dana I is one free and stylish text editor that tries to offer an alternative: A full-screen writing environment with zero distractions. It's just you and your text, letting you finally focus on what you're trying to say. Or so, at least, the theory goes. Once you begin typing, the chrome around Ommwriter's text area fades away, leaving you with nothing but your words. I really wanted to like Ommwriter. It is easy to see how much work went into its unique design: Ommwriter's creators say, "We believe that if you are in a beautiful and inspiring environment, you will write and create the beautiful and the inspiring." To this effect, Ommwriter Dana I ships with three low-key background patterns, and three looping ambient soundtracks. Ommwriter Dana II, the paid version for which you can set your own price, ships with eight background patterns and seven soundtracks. Pick your background image and soundtrack, stick your earbuds in, and let the world fade away as you compose your literary hit. Unfortunately, it doesn't really work like that. 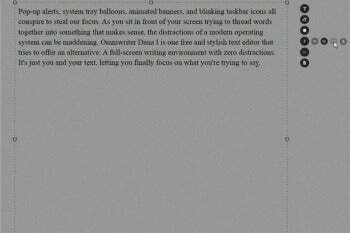 As a writer, I love the idea of a distraction-free full screen editor. In fact, I use one every day: WriteMonkey. But Ommwriter Dana I is so eager to impose its distraction-free vision, it takes things too far. For example, I have a dual-monitor workstation. As I write, WriteMonkey takes up one full monitor, leaving the other one open for me to use for reference material. If I find the other monitor distracting, I simply turn it off. Ommwriter Dana I doesn't give me that choice: It detects both monitors, and simply blacks out the other monitor. There is no way for me to use the other monitor, and no way to disable this functionality. Here's another example: Working in full-screen is great most of the time, but sometimes you need to have the window take up just half of the screen. Let's say you like roughing in a draft in a Notepad-like environment, and then switch to full-screen to flesh it out. Ommwriter Dana I does not let you do this: You either use it full-screen, or you don't use it at all. Most writers want to have an idea of how many words they've written so far. Both WriteMonkey and Ommwriter include a word count feature; WriteMonkey lets you either switch it on or off, or have it fade away while you work and reappear once you haven't been typing for a few seconds. It also lets you configure a session target, so you can visually see your progress. Ommwriter's word count appears at the bottom of the text area, and fades away when you're typing, along with all other window chrome. Unfortunately, the only way to bring it back is to reach for your mouse and give it a shake--pretty distracting. Ommwriter is truly beautiful to look at and listen to. If your writing style exactly matches the artistic vision of its creators, you're in luck. Otherwise, you should probably look for a more configurable full-screen editor. Writing in full-screen mode is important enough to shop around. Meditate upon this attractive, distraction-free word processing program.